SetSail FPB » Blog Archive » Matrix Deck Update: Were The Mods Worth the Cost and Time? It’s no secret we are getting older, and to be brutally honest, the rate of decay in our capabilities is accelerating. This rework project started as a way of making Cochise easier to handle, so as to allow us to carry on for longer than would otherwise be possible. The process has taken longer than expected because we kept finding significant ways of improving the functionality. 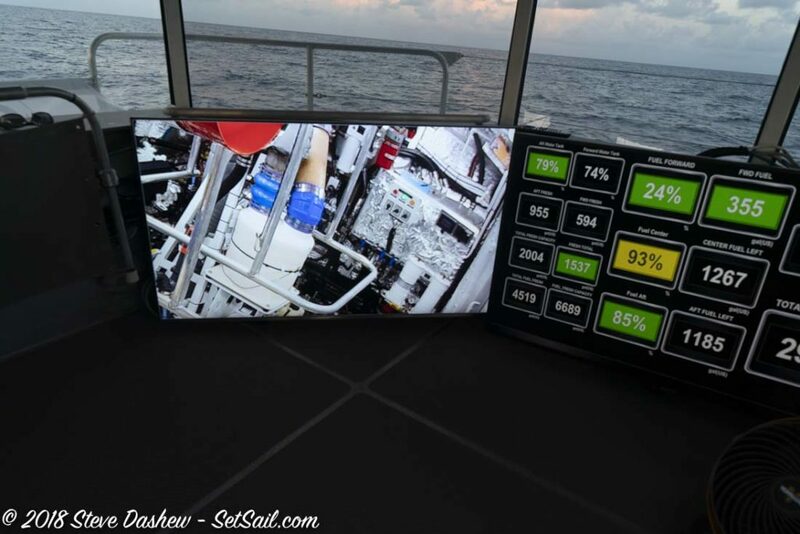 …and a pair of 55″ TV screens which are mounted to the coaming on the starboard side with standard home-style hinge mechanisms. We are still working out how these are best used. What we know now is that there is no perfect layout. 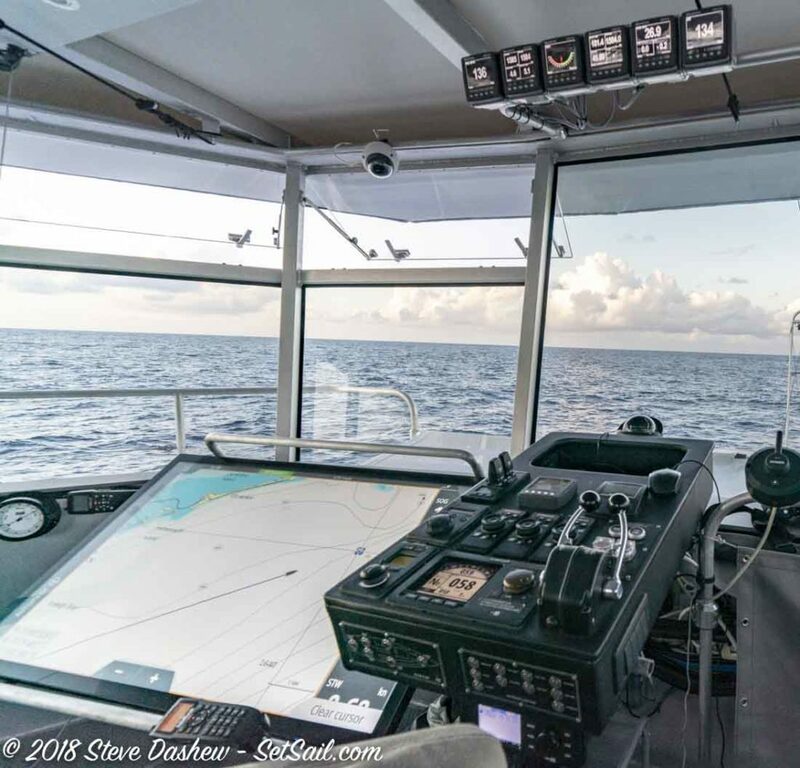 What we are using at sea is quite different from when we are on soundings. So we have made it easy to change around. 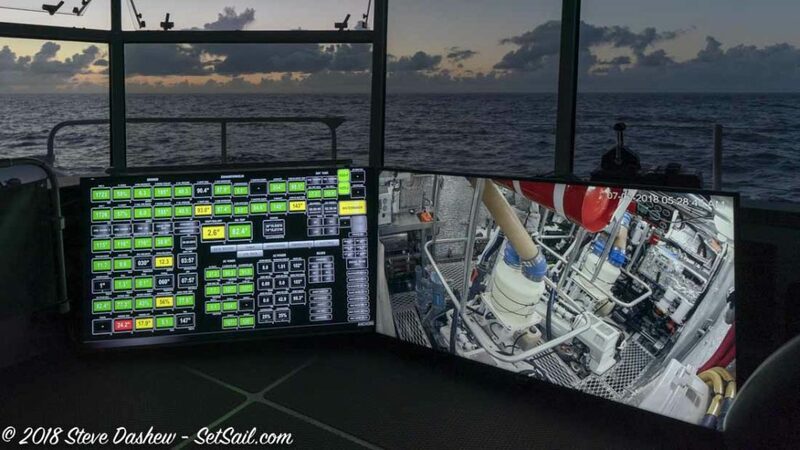 Offshore we will like a combination of nav data on the touch screen with the FLIR night vision camera on the second, and either the engine room cameras or N2K data on the third. 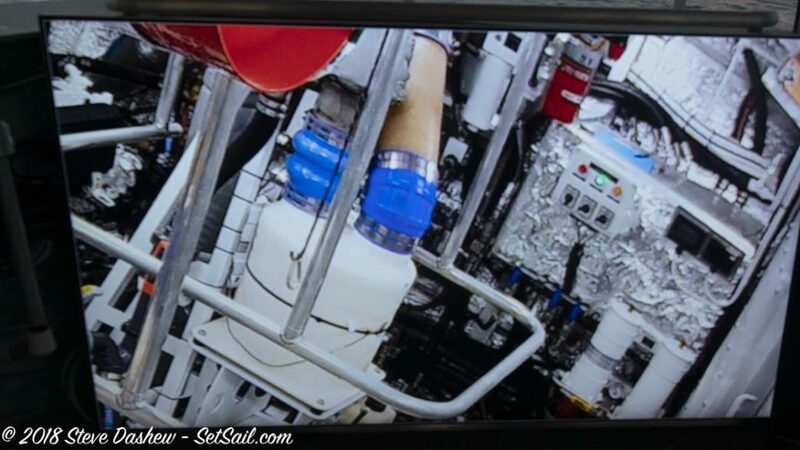 The engine room cameras are easily zoomed and rotated allowing for an easy detailed check. This is a first for us. We have always had a look and sniff once an hour. But with the engine room two full decks below, this time saving feature makes a lot of sense for us. The console has all controls close at hand when seated. 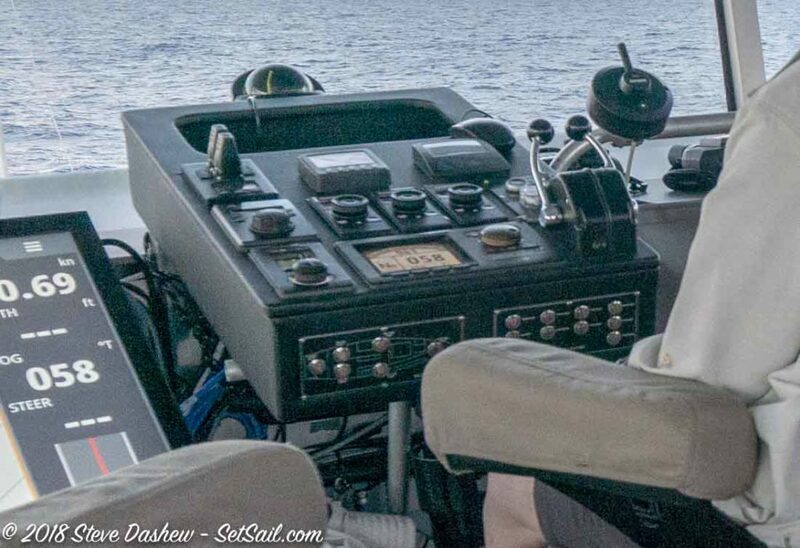 The new Simrad OP50 controller, three of which can be seen above, is very simple to use. Removing the previous built-ins opens the feeling of the entire Matrix deck while allowing much better sight lines when seated or standing. We are very pleased with the way this remodel has evolved. This entry was posted on Saturday, July 14th, 2018 at 2:59 am and is filed under Dashew Logs, FPB 78, The Logs. Both comments and pings are currently closed. Glad to read your changes are making life easier and running Cochise more enjoyable. To clarify, when you write the original was cut up and carted off, this is just the internal furniture – nothing done to the framing or roof correct? Also I assume the answer to this is weather related, but on passage what percentage of time do you spend running Cochise from the Matrix Deck vs. the Great room is weather is good. We just removed the forward furniture. Aluminum and roof remain. Prior to the change overall a little less than half our time was spent conning from the Matrix deck. Now it is more like 75/80%.